Retail inflation up 4.41% in Sep. Retail inflation rose to 4.41 per cent in September due to costlier food items in general and beverages and pulses in particular. New Delhi : Retail inflation rose to 4.41 per cent in September due to costlier food items in general and beverages and pulses in particular. The Consumer Price Index (CPI) based inflation in August stood at 3.74 per cent on cheaper vegetables, fruits and protein rich items, government data showed on Monday. The government has revised upwards the August retail inflation to 3.74 per cent from the earlier estimate of 3.66 per cent. However, the consumer inflation for the month under review has declined as against August last year when it stood at 5.63 per cent. 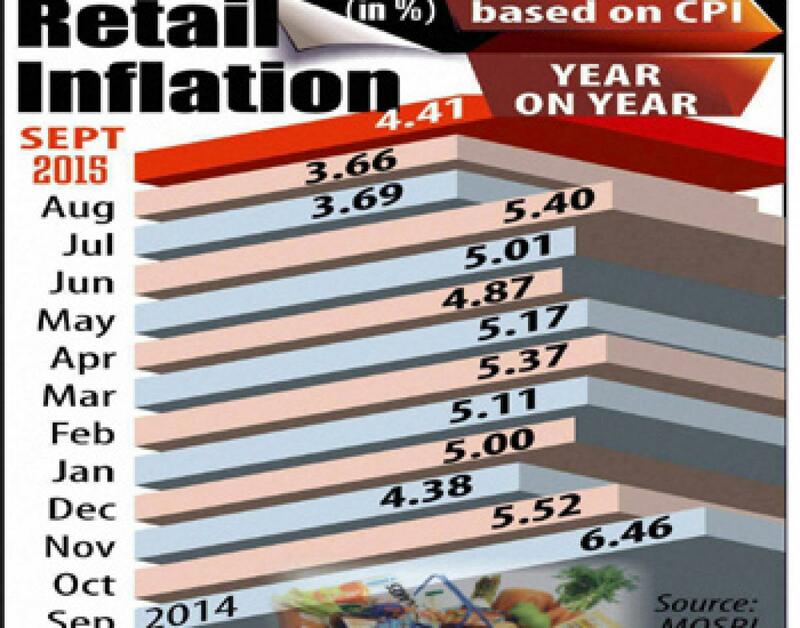 Food inflation during the month rose to 3.88 per cent from 2.20 per cent in August. Retail inflation in pulses and products category rose to 29.76 per cent in September. While the price rise in the food and beverages category almost doubled from a month earlier to 4.29 per cent in September, inflation in cereals and products was also higher at 1.38 per cent. During the month, eggs also turned cheaper with 1.19 per cent price rise. However, the rate of price growth for 'cereals and products' was faster at 1.38 per cent. Break-wise; retail inflation rose to 5.05 per cent for rural segment in September and for urban sector it was at 3.61 per cent.